The long-awaited German offensive on the Western Front began against the Low Countries in the early summer of 1940 [...] In a week the situation in France gravely declined, and the 1st London Infantry Brigade was ordered to take over at once the defence of the Isle of Thanet. It had been reported that parachutists were likely to land, hence the haste. With battalion headquarters at St Nicholas-at-Wade, the London Irish spent the first night in Thanet on guard. Roadblocks were set up, and at five o'lock the next morning a stand-to was ordered as enemy parachutists had been reported in Blean Woods. It was a false alarm. All roads to the coast were blocked, and no one was allowed to pass without a scrutiny of their identity papers. 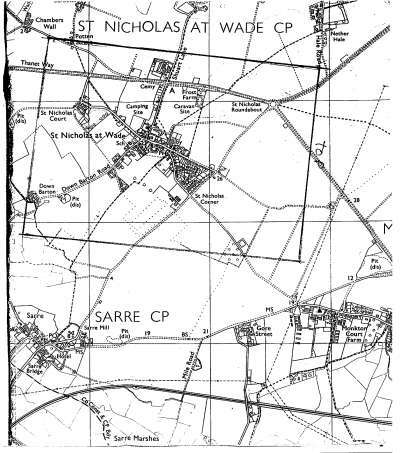 The tactical situation in Thanet was one of great concern [...] The key position at St Nicholas-at-Wade was designed so that any scattered troops or R.A.F. 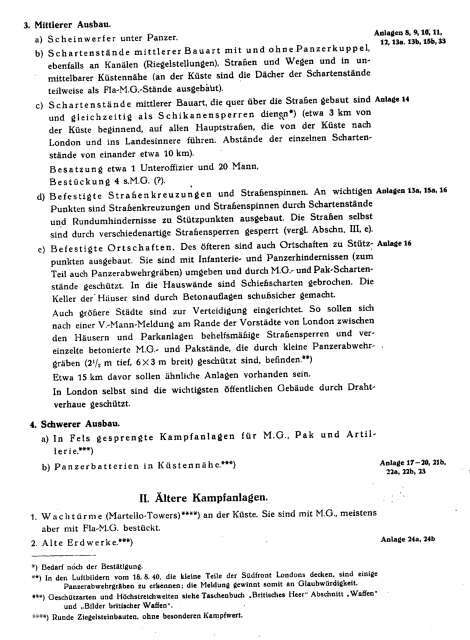 personnel could retire to it. 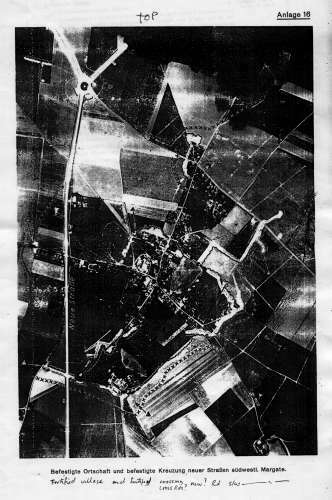 The Germans were evidently aware of what was happening, as shown by the recently discovered analysis shown below, and the aerial photo accompanying it (the map shows the area covered by the photograph). Many pillboxes from the time are still visible in the fields around the village. There are rumours that there was also a small underground encampment near Sun Lane. Some houses in the village were requisitioned by the army, including Street Acre, whose owner Tom Jones was one of the founders of CEMA, the Council for the Encouragement of Music and the Arts (which aimed to provide stimulating reading material for British armed forces). When the officer in charge sent a message to ask him "What shall we do with all the books? ", TJ's predictable reply was a two-word "Read them! ".